Get a clean so deep you’ll wonder if a pro did it. You don’t have to buy expensive cleaners marketed for granite only. These are pricey and totally unnecessary for the task at hand. However, there are several things you can do to make sure your granite counter tops stay looking shiny and clean. Follow these easy steps on how to clean granite counter tops like a pro, and your granite counter tops will last a lifetime. The very first thing you need to do is check the seal on your granite counter tops. The seal is what protects the granite from stains and bacteria. 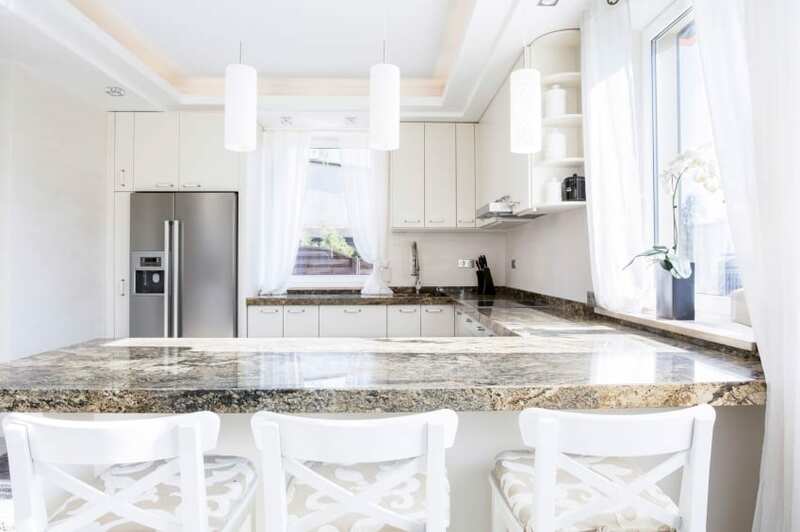 While granite is less porous than marble and other counter tops, it still needs a good seal. To check the seal, place a few drops of water on the counter top. If the water beads up and does not soak into the granite, you have a good seal and you are good to go. If the water soaks into the counter top within a few minutes, you will need to fix the seal of your counter tops so that it will last. You will need to buy a commercial granite sealer for sealing the granite. Transfer the product to a good spray bottle. You must thoroughly clean the counter top first. Mix a cup of 91% isopropyl alcohol with one cup of very warm water and five drops of mild dish detergent. Using a terry cloth towel or dishcloth, wipe down the entire counter with the cleaning solution. Then dry the counter with a microfiber cloth. Wait about 20 – 30 minutes for the counter to be completely dry. Spray on the sealer and make sure you coat the entire surface. DO NOT rub the sealer in as that will actually remove it. There may be a slight haze as it dries, but that is OK. After another 20 – 30 minute drying time, use the microfiber cloth to wipe up any excess sealer and to buff the counter top. Do the water test again to make sure you have a good seal. For daily cleaning, all you need is a mixture of warm water and mild dish detergent. You don’t need the pricey cleaners marketed for cleaning granite. The seal is protecting the granite from bacteria, and warm water and dish detergent is suitable for daily cleaning. Use a terry cloth dish rag for cleaning and a microfiber cloth for drying to prevent streaks. In addition, clean up any spills immediately so they don’t have a chance to damage the finish. If you do notice stains, you can use a baking soda poultice to soak up the stain before cleaning as usual. To disinfect and thoroughly clean your granite counter tops, conduct a monthly cleaning using the alcohol, water, and mild dish detergent mixture discussed earlier. Alcohol and water have the same ph. level and will not strip the finish or damage the granite. Alcohol is also a natural antiseptic that will disinfect the counter tops. Using these tips on how to clean granite counter tops like a pro will have your granite counters looking brand new for years to come.